I really wanted to get the longboard working so I had a look at buying Wiiceiver from AustinDavid.com. The source code is available on Github and I had a spare devicter devDuino Sensor Node V2 sitting on my desk. With some modification (changing pins numbers and removing all references to the second LED) I got the wiiceiver code running on my devDuino. 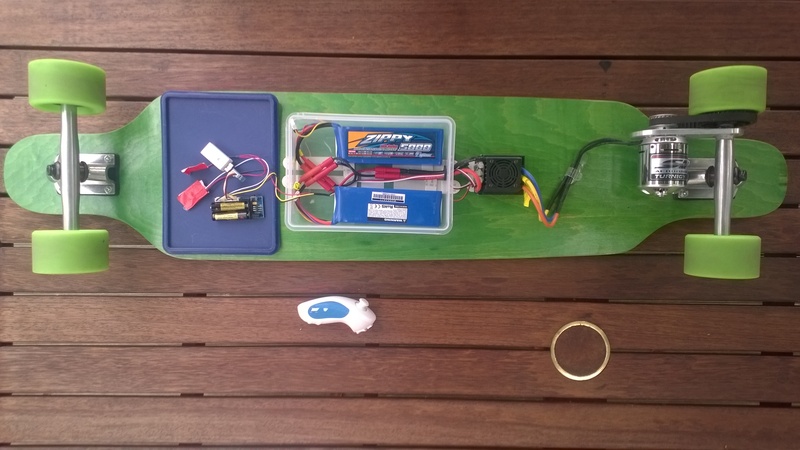 The Electronic Speed Controller(ESC) and the plastic lunch box (containing the batteries and devDuino) are attached to the deck with 3M Command adhesive strips. The first set of command adhesive strips I tried were for hanging pictures and had a Velcro quick release system. This approach was a failure and the ESC & electronics box fell off after 10-15 minutes use. The Velcro backing tape was getting pulled in the wrong direction so was unable to hold the weight of the electronics when vibration levels increased. I tried them because a “quick release” capability would be handy but I have gone back to using conventional 3M Command adhesive strips and these are working well. Initial rides went well, though I need to recalibrate the acceleration and braking ramp up/down settings to suit my hardware and riding style. WARNING – Disconnect the power supply pin on the Grove Branch Cable for Servos as the ESC will supply sufficient current to make the batteries on the devDuino go pop. Wrap some tape around the other servo connector so it can’t cause a short circuit. Thanks to Austin David for making the code for the Wiiciever open source, if anyone is interested in my code I can tidy it up and share. * Pin IDs -- NOT LOCATIONS !!! The rest of my changes were commenting out all references to the Green LED as the devDuino only has one onboard LED. The mobile device configures the Gralin nRF24L01 library, initialises the Love Electronics ADXL345 Accelerometer library, and creates two timers, one for the throttle position the other for the accelerometer. 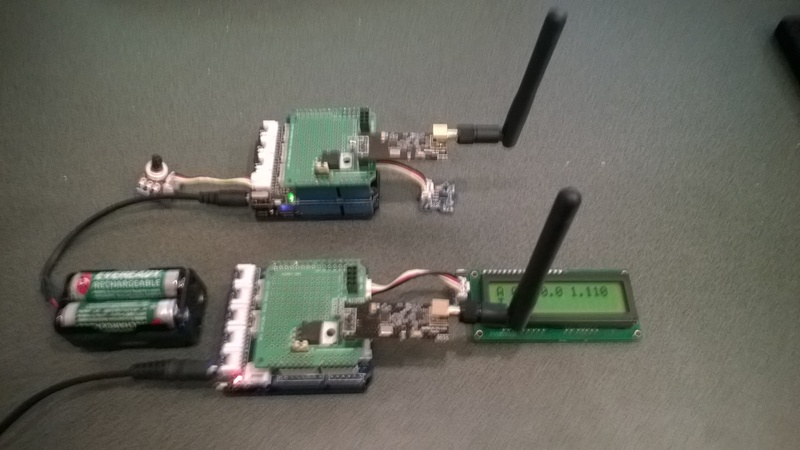 The base station works in a similar way, configuring the nRF24L01 library then displaying the received messages on the LCD Display.